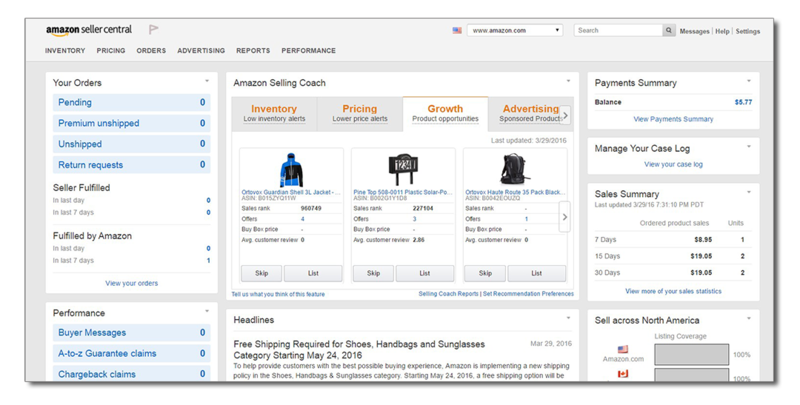 Once you log in, you’ll see your own Amazon Seller account dashboard showing all kinds of information. This is where you’ll spend a lot of time managing your account, your inventory, and everything having to do with your new online business. 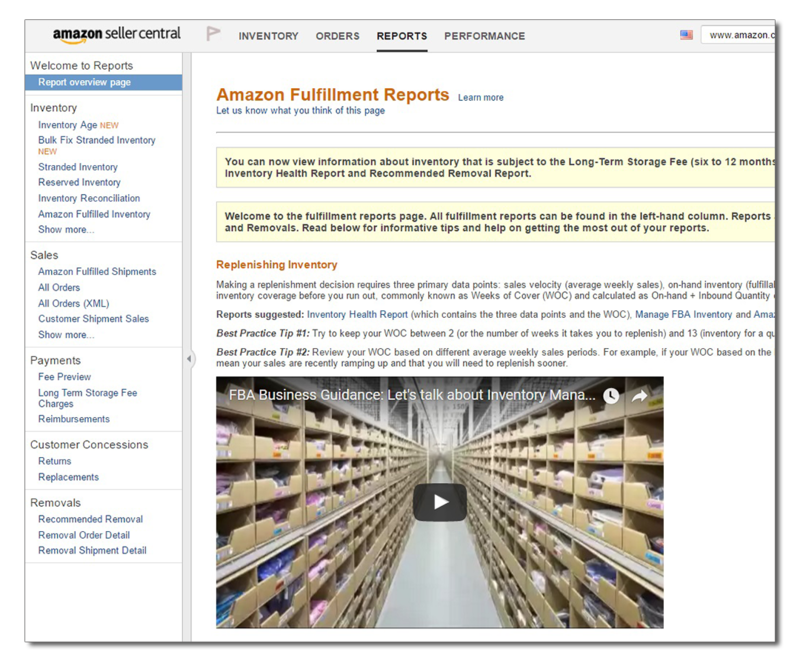 The Inventory, Pricing, Orders, Advertising, Reports, and Performance shortcuts at the top of this page will bring you to each respective area within Seller Central but since this is an Amazon Seller Central tutorial, let’s go over the little window widgets that give you a quick snapshot of some pertinent information. As you get more familiar with this page, you’ll notice there are certain windows that you’ll look at more than the other. 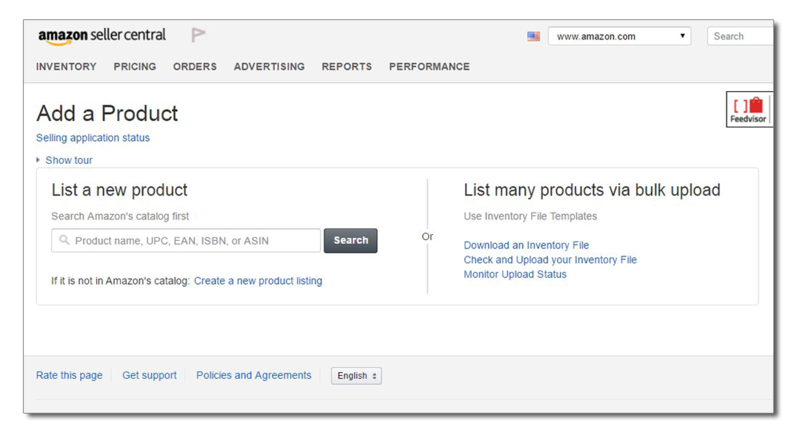 Let’s go over some of those and the Amazon Seller Central navigation in general. This window, located on the upper left side of the screen, shows you just that, your current orders. The Pending, Premium Unshipped, Unshipped, and Return request links are shortcuts to each respective area within your Seller Central dashboard. 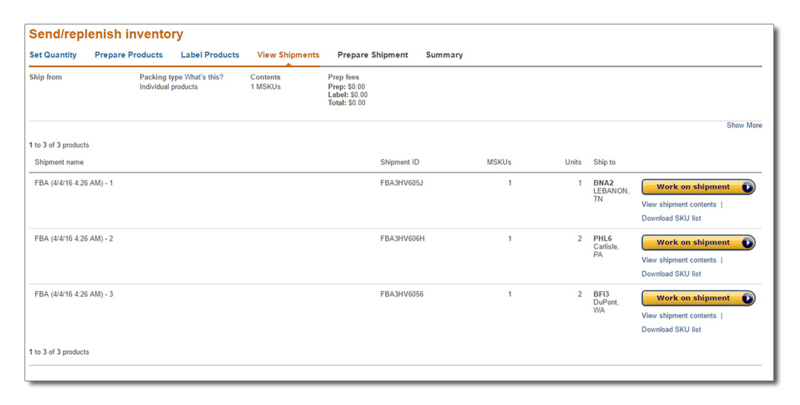 For instance, if you click on the Pending link, this will open another page and show you your pending orders. If you click on the Return requests link, it will bring you to the Manage Returns page. This is pretty straight forward. Moving directly to the right side of the screen is your Payment Summary window. This shows you the current amount of money you will have deposited into your bank account. If you click on the View Payments Summary link, this will take you to the page that gives you more information on your orders, the FBA fees and charges breakdown, and the scheduled date that Amazon will start the transfer of funds into your bank account. There are other views you can check out such as the Transaction View that gives you a more detailed analysis of each order and the All Statements view. This window is directly below the Payments Summery window. If you have an open case with Seller Central support, you can view any updates here. This window is below the Case Log window and gives you a snapshot of your sales for the last 7, 15, and 30 days. It has the dollar amount worth of sales and the number of units sold. You can get more detailed reports by clicking on the View more of your sales statistics link at the bottom of this window. This window is on the lower left side of your dashboard. It shows how you’re doing as an Amazon seller. You can view your customer feedback stats, see messages from your buyers, chargeback claims and your Account Health rating. This window is located on the lower right side of the dashboard. It shows you a summary of any promotions you currently have running. 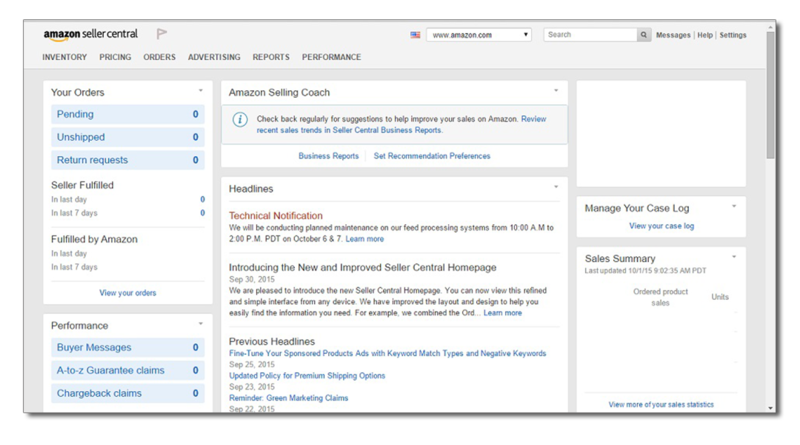 There are other windows like the Amazon Selling Coach in the center column, the Headlines window also in the center and the Sell across North America. Your business is all about selling products. 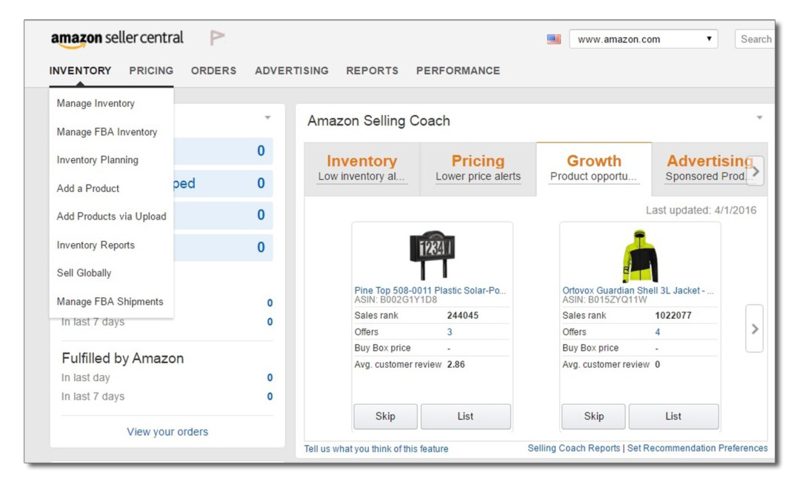 Since you’re reading this Amazon Seller Central tutorial, you’re getting an idea of how to sell on amazon but how do you add that inventory? Follow these steps to get you on your way. To start, you need to get to the inventory module in your account. After you log into Seller Central, click the Inventory shortcut at the top of the dashboard. A drop-down menu will appear and you just click ‘Add a Product’. This is the page where you add the products you’re looking to sell in your store. There are millions of different things available on Amazon and adding an item to your inventory is as simple as searching for it! After a few clicks, it will be listed and available for sale on your site. At this point, enter the product name you’re looking to sell in the search box. In this example, let’s use the name ‘prop money’. 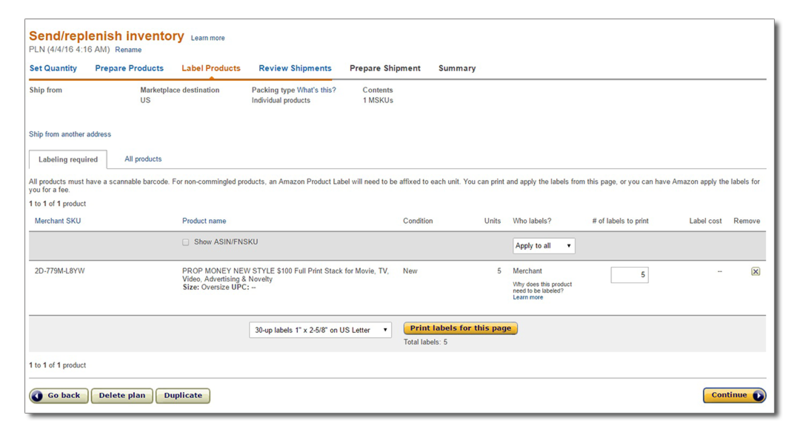 You can also search using the item’s UPC, EAN, ISBN, or the ASIN number but in this example, just searching for the product name is fine. 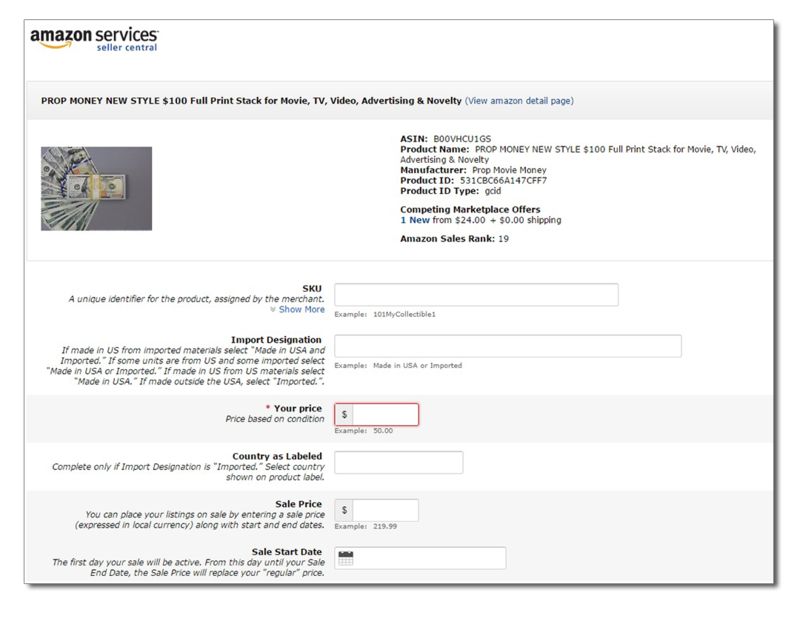 Once you find the item you’re looking to list, click the ‘Sell yours’ button under the description. You will be taken to this page where you set your pricing, condition, and other settings. Since this product is already listed, most of the information is already entered. What you need to set is your price, the condition (in most cases, choose ‘new’), and the fulfillment channel. The Fulfillment channel is how you determine if you want to use FBA and have Amazon handle most of the selling legwork like the shipping and customer service needs or you can choose to handle that yourself. Once you’re done, click the ‘save and finish’ button at the button of the page. This page comes up after you’ve entered and saved a new item. At this point, it’s pretty self-explanatory. Fill in how many units you will be sending and print your labels. Click Continue. You’re then brought to this page where, as you can see, Amazon will assign and distribute your product to many warehouses to ensure the most efficient way to fulfill orders. Click Approve shipments at this point to move on to the next screen. This page is will show you the individual shipments to each fulfillment center. Click the Work on Shipment button for each shipment. 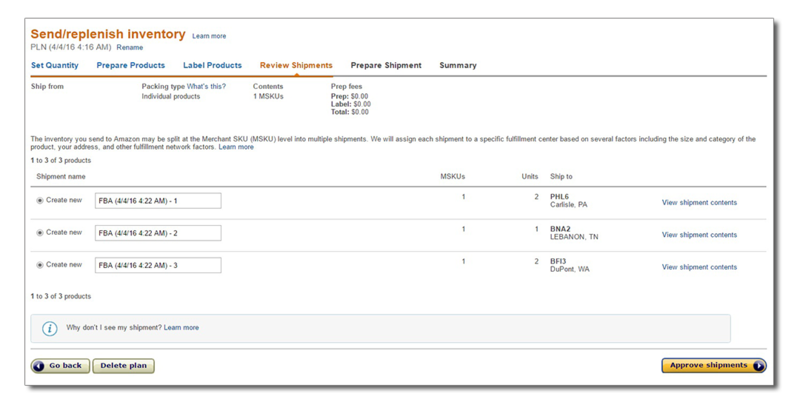 After clicking the Work on Shipment button for each shipping plan, you’re brought to the below page. This page is where you review what you’ll be sending in, the box dimensions, the box weight, and the shipping costs. Once you accept the shipping charge, you print out the shipping label, put on the box and send it out. Repeat this step for each shipping plan and you’re done! If you are to succeed in any business, information plays an important role and FBA is no exception. 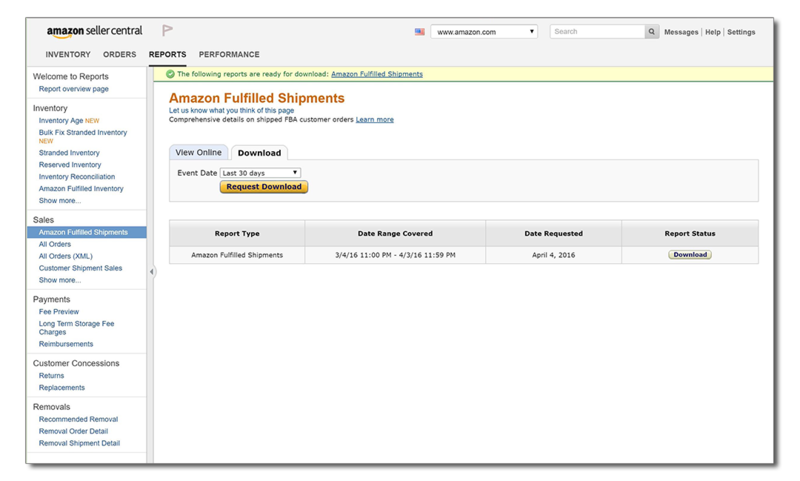 Within your Amazon Seller Central account, there’s the Report shortcut at the top of the page. If you click it, you’ll be taken to the Reports page. As you can see, there are many different reports available to you. These reports contain information and can be used to analyze your Inventory, Sales, Payments, Customer Concessions, and Removals data. There are many reports to look at and depending on the information you need determines where you should look. 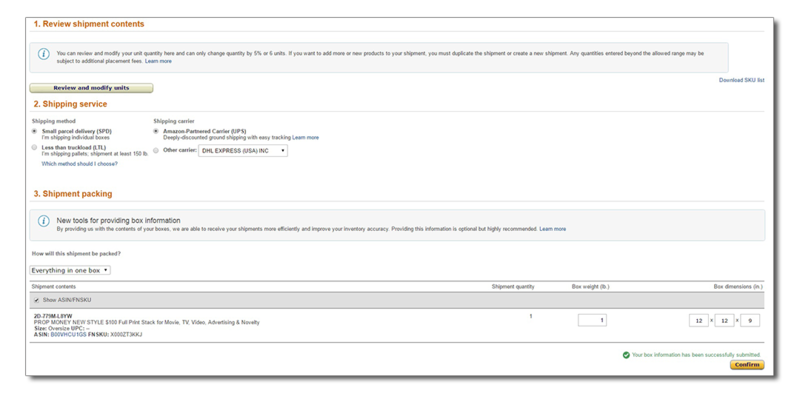 For example, if you’d like to see your Amazon Fulfilled orders within the last 30 days, under the Sales section, choose the Amazon Fulfilled Shipments link and click the ‘Event Date’ box. A drop down menu will show up. Just choose ‘Last 30 days’. You should end up seeing a page like this one. Click the download button and within a few seconds, a text file will be generated. That’s your report. It contains information on your last 30 days of sales. More information is available about this particular report here. Use these reports to your advantage. Run an Inventory Age report to help you identify items that have the potential of being charged a long term storage fee. If this report comes back with items that will potentially get charged the storage fee, you can then run a Recommended Removal Report and start the process of returning or disposing of the items before that fee gets implemented. As you run your business, you will find many of these reports will help you to save money and be more efficient. The Buyer-Seller Messaging Service is a service that allows you to receive and send emails to your buyers. It works like any other email service. If you’re using FBA, you can use this system to answer questions your buyers may have about your products and things like that. 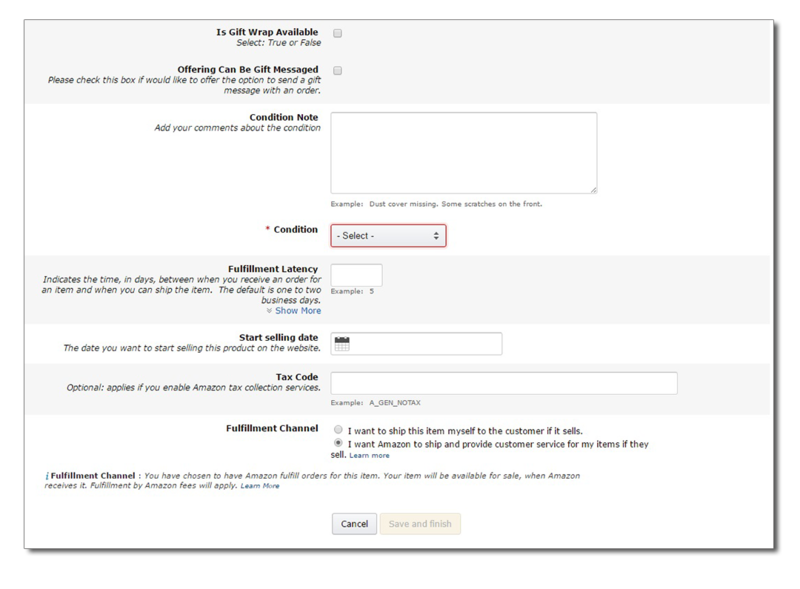 Amazon will still handle inquiries on your behalf as an FBA subscriber. One thing to remember is there are guidelines that you need to remember with responding to your buyers. You can only contact buyers to respond to customer service or order questions. You cannot use this messaging system for marketing or promotional purposes. You can learn more about Amazon’s guidelines, how to create and send e-mail templates and lots of other information here. Amazon prides itself on giving a superior customer sales experience. To maintain that year after year, it encourages feedback from its buyers so that it can improve things and that includes sellers! Think about the last thing you bought from Amazon. Most likely you looked at the reviews to help with your decision. Having positive reviews directly impacts on you not only winning the buy box but how often you get it. You’re in this to make money and having to lower your price constantly to get buyers is not a great way to run a business but keeping high customer satisfaction levels will ensure that you win that buy box more often than a poorly performing merchant. Customers will often review a seller’s feedback and buy from the higher rated ones. A great way to increase your buyer’s satisfaction and positive reviews is to ask for feedback. Amazon not only allows this but encourages it. To help with managing your account health, review how you’re doing by clicking the Performance shortcut at the top of the page on the dashboard. You should see a page similar to this one. 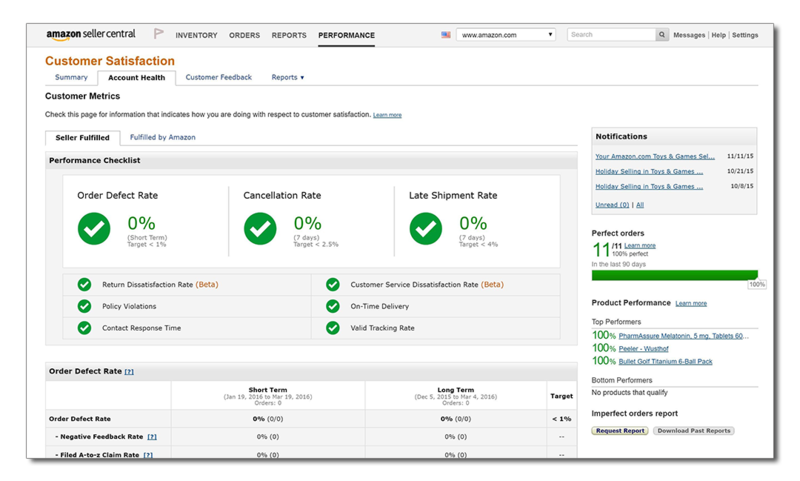 It gives a snapshot of your account health and performance in relation to Amazon’s expectations. This is basically showing you how satisfied your customers are with your service. It measures many things such as order defect rate, late shipments, refund rates, customer service dissatisfaction rate, and other metrics. It’s easy to read. Think of it like a traffic light. Green is good, yellow is caution and red is bad and needs attention. If you see some red areas on your performance page, you should take immediate steps to improve whatever it is that’s the problem. Some suggestions to help with maintaining a great account health score would be answering e-mail messages within a 24 hour period, be proactive with refunds, if you’re not using FBA, maintain proper inventory levels and more. Promotions are a great way to entice customers to buy your products sooner instead of waiting. You can create and use promo codes as a marketing tool to help with reviews too. One way is to give codes out to family and friends in exchange for reviews. This is a great way to increase your seller ratings if you’re just starting out or have a new product launch. There are different promotion options available such as a purchase discount (either a dollar amount or percentage off of the purchase), BOGO (buy one get one free), free shipping, or an external benefit of some kind (spend a certain amount of money or a certain item and receive a free instructional video, etc). 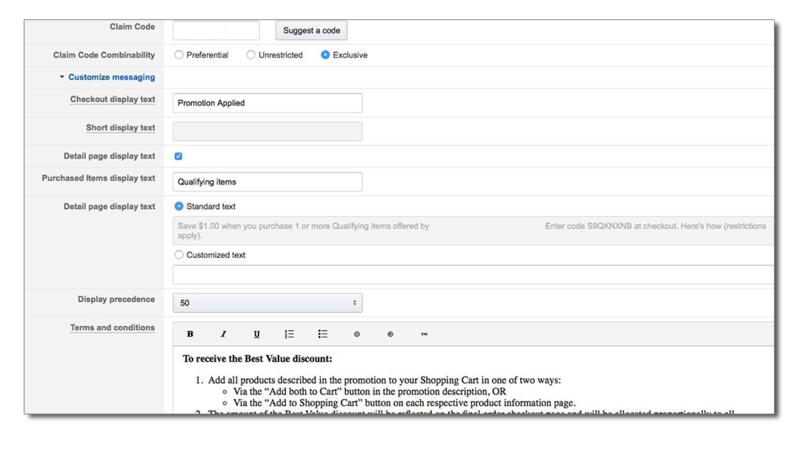 You can create claim codes that your customers need to enter before any discounts will apply or have a site-wide promotion, it’s up to you. There are some steps involved when creating promotional codes but you need to be careful. You don’t want to end up putting your entire inventory up for sale for $0.99 when you only meant to create a one-time promo for your family so pay close attention. Let’s create a single use code that gives a discount off a sale. 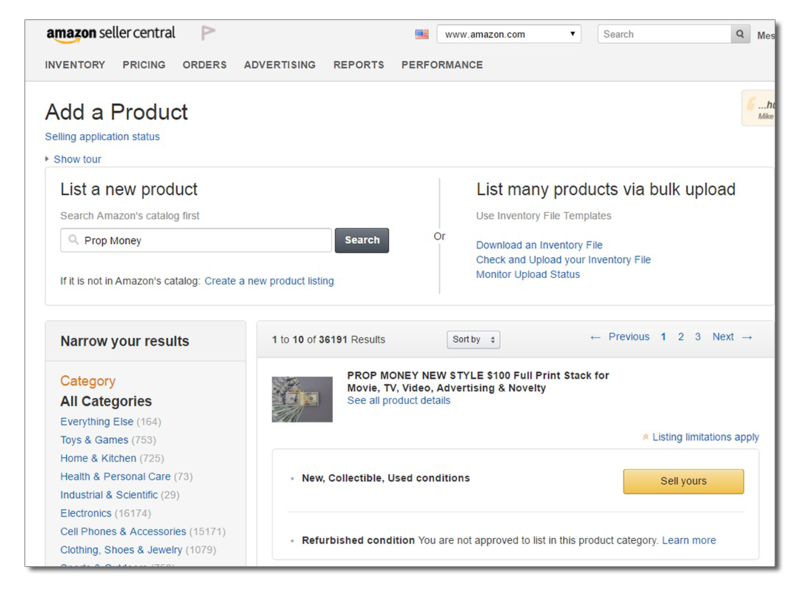 First, go to your seller central account and click on the Advertising shortcut at the top of the page. A drop down menu will appear, choose Promotions. On this screen, choose “create” under the “Money Off” heading. Skip the Advanced Options for this setup. At this point, click on the Customize messaging link to expand other options. The only thing you need to do here is to make sure you UNCHECK the box where it says “Detail page display text”. If you don’t do this, then this offer will be available to everyone, not just the people you intend on giving this promo code to so make sure this box is unchecked. You’re almost done! Click Review and go over your choices and if they all look good, hit the Submit button. Remember that your promotion codes need 4 hours to process. Now you have to create the single use codes. After clicking the submit button, you should see a window stating that “your promotion has been created” and underneath that should be a link that says View or modify your promotion. Click this. On the next page, choose Manage Claim Codes and on this last page, enter a name in the Group Name box and the number of codes you’d like to create. That’s it! There are many steps here so it may be easier to see it done for you. Watch this step by step video that goes over creating a single use discount code. It’s obvious that Amazon is not the only marketplace to purchase goods online. There must be millions of e-retail stores on the web and for many different reasons, these companies may not be selling directly in Amazon’s marketplace but with sponsored ads, they can drive some of that traffic from Amazon to their own sites and potentially increase sales. There are two types of ads available on Amazon. Amazon Sponsored Products and Amazon Product Ads. They sound the same but there are some differences. Uses keywords set up by the retailer. When a shopper clicks on the ad, they stay on Amazon to complete the sale. Great for products that win the Buy Box a lot or for Private Label Sellers. Payment is a cost per click and auction-based model. Uses keywords but Amazon chooses what they are. When shoppers click on the ad, they are taken to the retailer’s website to finish their purchase. These ads are good for retailers that want to sell on Amazon but don’t want to share their sales data. They also don’t pay any fees like those associated with FBA. Each ad type has different benefits that one retailer may want over another. It’s up to you and how you run your business. You can start advertising on Amazon here. 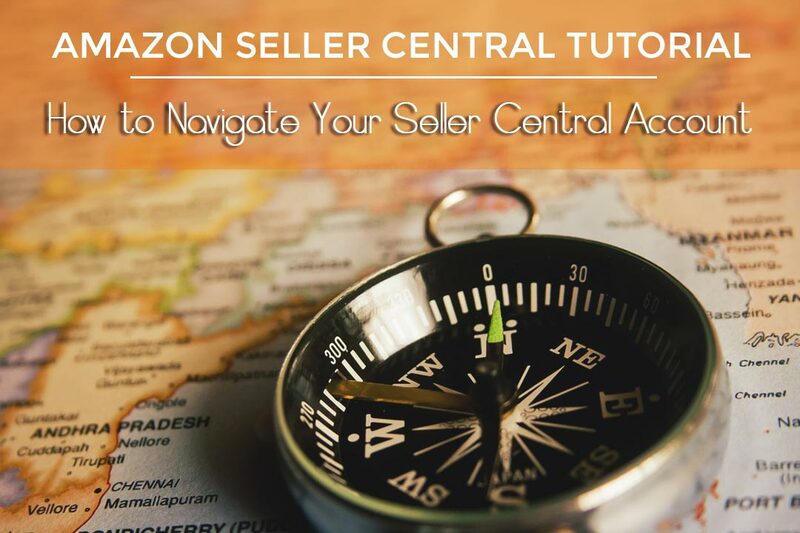 This Amazon Seller Central tutorial contains enough information to start you off on the right track of how to sell on Amazon. As with any business, you’ll learn more by doing. There will be mistakes made but that’s part of learning. You can do this. It’s not complicated. After you add a few products, create a few shipments and get your first few sales, this will become easier and easier.